My breath was a fog, wafting through the roseate light of morning. The temperature on my thermometer had slumped to minus 15° C (5° F) in the early hours and was stubbornly refusing to get much higher whilst my mind was violently and reluctantly dragged backwards to the European winter of 2010 when I set off from the UK amongst similar climes. I had crossed the border into Bolivia and every night I wore my wardrobe to ease the chill, every night the cold created a struggle to find sleep and every morning began with the task of melting solid ice to make coffee. I’ve spent weeks climbing above and dipping away from the 4000 metre mark but at 4500 metres up in Bolivia, by some mystery of meteorology, the temperature had taken another dive and I have returned to the snow zone. But now at least, I have company. A new character enters my story – Nicky Gooch, a solo cyclist, a professional bike mechanic, a Brummie and a roman candle. We had met before in Patagonia and rode together for a few days in a gaggle of other bikers. After my time-consuming mini-disaster in San Pedro I had been over-taken by many of the cyclists I had passed further south. Nicky was a tall, straggly-haired biker with ginger stubble and a thick midlands accent. We decided to tackle the Lagunas route through Bolivia together and we made a good team. Nicky helped when I freaked out about the state of my bicycle, offering his mechanical skills or doling out reassuring advice. Equally when Nicky, a hypochondriac, developed chest pain I would remind him about all the beer, cigarettes and coffee he consumes and offer him an antacid. On our second afternoon in Bolivia a frigid wind gathered momentum until it’s howl was all-pervasive and it’s thrust marred our progress towards the 5000 metre high Paso de Sol de Manana (pass of the morning sun). By evening all we could do was push our bikes up the sandy track, unable to ride in the gale. Decisions were now shared and some of the usual burden of choice off my shoulders, that night our options were to backtrack fifteen laborious kilometres to shelter or just rough camp where we were, we agreed on the latter. I shouted to Nicky: “it’s going to be a tough night!”. “Good job we’re f***ing hard then!” Nicky yelled back. I hoped he was right. The wind was firing across the wilds with the force of a water cannon. With no natural shelter around I began to fear my tent wouldn’t hold up to the punishment and as we built a small wall as a protective windbreak using some of the surrounding rocks, all I could think of was sheering tent poles and a crumpled mass of polyester encasing two shivering bodies. Finally, inside my tent I imagined I should be penning my final words to relatives like Captain Scott on his ill-fated journey to the South Pole “These rough notes and our dead bodies must tell the tale…”. Instead, at almost 5000 metres above sea level, in freezing, storm force gales, on the slopes of a remote Bolivian mountain, Nicky pulled out his laptop and we watched ‘Only fools and horses’, a dated British sitcom set in Peckham, South London. In the freezing Bolivian mornings I started my day by yelling temperature updates to Nicky in the neighbouring tent. “Time to get up dude, it’s only minus ten”. And then a little later “Nicky, it’s minus nine, time to get moving!” During the day the temperature often remained below freezing and the frozen ice inside our water bottles never had the chance to thaw. Instead of flagging down one of the tourist-filled jeeps travelling through the region we decided to use Nicky’s stove to melt snow so that we could drink. For most of the day my face remained concealed by an ice encrusted Buff. The apples I had saved for lunch were frozen solid and my coca cola had become a Slush Puppy. On the day we passed a thermal pool I plunged into the welcome warmth in my boxer shorts, a day later my damp underwear had transformed into a solid, crumpled ball of ice and fabric. Bolivia was a collection of rumours and I had only a few, nebulous expectations. I had seen some photos of the traditional garbs – women wearing bowler hats, adopted from the British and a traditional skirt called the pollera, a symbol of pride in being indigenous. I’d also heard enough to be worried about the bad roads and bad drivers though I knew that compared to Chile and Argentina, the price of almost everything would be lower. Occasionally Bolivia rekindled memories of Africa, although on the surface it was a world away, there were some subtle reminders. Whilst there were plenty of shops, business had moved to the street, African-style. The smell of grilled goat’s meat from the roadside vendors drifted through the cities. Bolivia had the typical South American ratio of stray dogs to people (roughly 20000000 : 1) and the outskirts of every sizable town were guarded by the ugly twin bouncers of a litter-strewn wasteland and stinking sewage. The dogs nosed through both. Tragically Bolivia joins the ranks of one of the dirtiest countries on my route so far, alongside the other unfortunates of Syria and Albania. Rubbish has become a feature of the landscape and is as prevalent as the speeding lunatics in unroadworthy vehicles plying Bolivia’s main highways. But Bolivia is also full of the things I love most when I travel somewhere new – Bolivia is full of questions. I tried to decipher strange scents on the street, the contents of the weird drinks brewed by the road and when I felt the eyes of locals taking me in, what they might be wondering. I’m enjoying Bolivia, because it keeps me guessing. 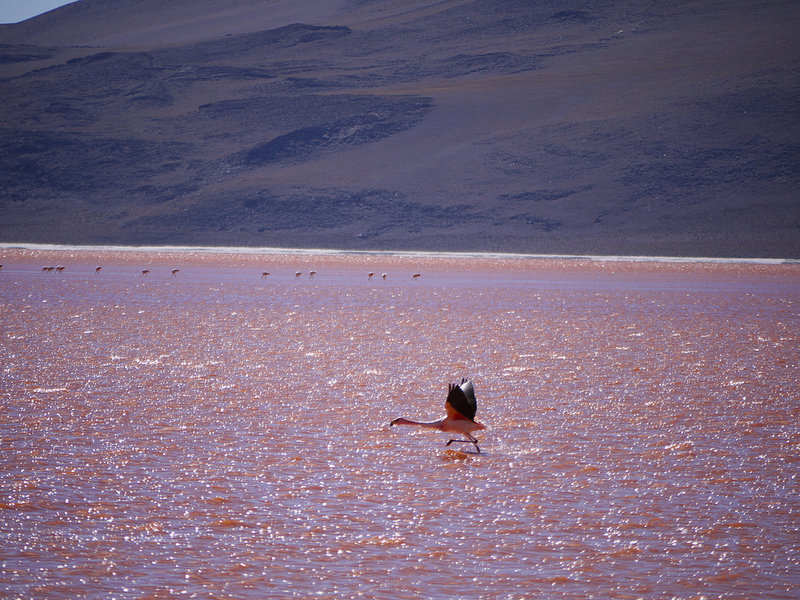 I hadn’t done much research on southern Bolivia before we set off so when we rolled over the apex of another hill and a surreal cherry-red lake revealed itself beneath mountains I had no idea I was looking at the famous Laguna Colorada, the Red Lagoon, but I was impressed nonetheless. The sanguine stain of the waters is derived from a type of algae which thrives there. Flamingos waded and dipped their crooked beaks into the red, one or two began their run up to flight, dead ones were scattered over the salt-stained banks. White islands of Borax dissected the red ripples and when jeeps circled the far shore, a vaporous haze kicked up and I felt I had entered a severe, nightmarish netherworld. And so another character arrives on the scene: Marta – Polish, a solo cyclist and another roman candle. She was also only the second lady I have seen riding solo over the last two and a half years. When we met in a tiny Bolivian highland village she was explaining to a local man that she was starving after cycling all day and that she needed meat… “so do you have a machine gun so I can hunt some llamas?” she asked him with a wink. I liked her immediately. That night Myself, Nicky and Marta all binged on wine, chocolate, rice and chips in the village before setting off in opposite directions, hardy Marta was travelling to the increasingly chilly South. 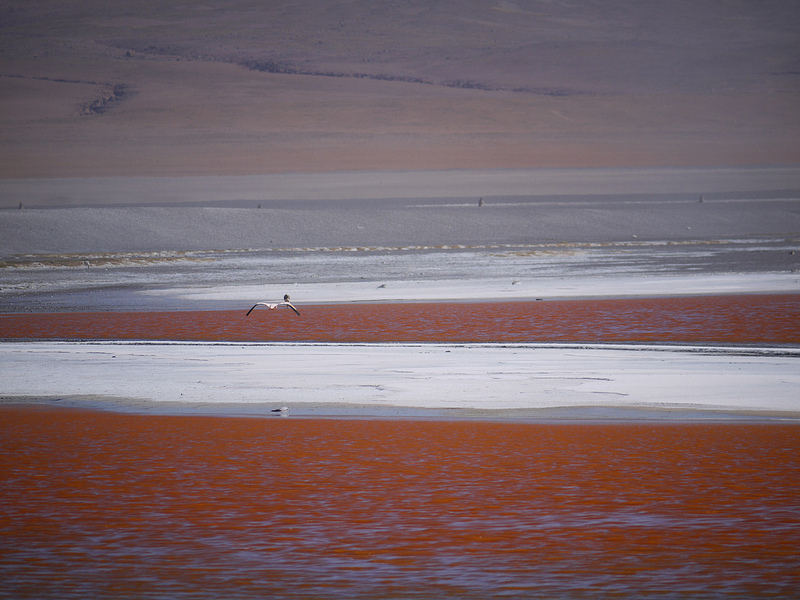 I admit it, I was worried about cycling the Salar de Uyuni, the world’s largest salt lake. My expectations, like the geography of the Salar itself, were high. Ever since I had first glimpsed photos of cycle tourers, beaming and, I imagined, effortlessly gliding across the perfect white sea of salt, I had yearned to ride there, perhaps more than anywhere else on earth. Cyclists talked of “an unforgettable experience”, what if the riding the Salar didn’t live up to my mental version? What if it was disappointing? What if it was forgettable? “Look, over there!” shouts Nicky, motioning to a thin belt of white to the West, wedged between the horizon and a featureless expanse of brown earth. My pulse quickens as I think about the fact that where the white begins, it doesn’t end for almost 170 km, the Salar has an area roughly the same as the island of Jamaica. Soon we reach a memorial plaque for the victims of an accident in 2008 in which two tourist jeeps collided. The most probable scenario is that both drivers were playing the “Iron Man,” travelling head to head and trying to be the last vehicle to deviate from the collision path. Both jeeps were travelling at over 100 km/hr and gasoline containers were attached to the vehicle’s fronts. Thirteen died in the crash and ensuing blaze. After finding out these gruesome details, my faith in Bolivian drivers plummeted yet again, and it had been already cruising towards rock bottom, fuelled by my experience on Bolivian roads so far. Ten minutes later we reach the edge of a mirror – a shallow but vast pool of water perfectly reflecting the azure sky above, a couple of clouds are in a listless drift across the ground and sky. Within the water, snake-shaped mounds of white salt protrude and I guess we can pedal across without getting knee deep in brine. On the other side lies the reason for all the water here, conical piles of salt stretch out in rows, this is where they mine lithium, the Salar holds up to 60% of the world’s reserves. We set off, splashing through the salt water and meandering between the shimmering islands, occasionally stopping to heave our entrenched back tyres out of the sodden gunk beneath the water. A minute later blue gives way to an unending honeycomb of bright white salt and we ride along, unconfined, free, ignoring jeep trails and heading just ‘across’. The endless, gleaming jigsaw of wonky hexagons (salt tiles) has to be one of the most impressive sites in the natural world, it’s a privilege to ride it and we can’t resist camping out on the Salar that night as well. Our timing is perfect, tonight a full moon rides the eastern horizon, illuminating the string of tourist jeeps returning to town, and with only a light breeze I can just detect the faint thrum of their working engines. Fiery and towering tropical cumulus bunch up in the northern sky, alight with the dregs of sunlight and the occasional flash of lightning. For a while we frame photos as the final beams of light are replaced by the white glow of the moon and night claims the Salar. Coldness ends our photography session and we set up camp. The next day we ride west, our spirited zigzag leaving faint trails and branding the crust of salt as we try to avoid the small holes which penetrate the Salar, linking the surface to an underlying pool of brine. As we travel, a light crunch of the salt beneath our wheels and the soft whistle of the wind travel with us. In recent years a sport, you could say, a tradition, has grown amongst cyclists on the Salar – The Naked Ride-By. Crazy Guy On A Bike, the largest online community of cycle tourers in the world, is full of photos of naked bodies on bicycles on the famous white backdrop. Nicky and I weren’t about to let the opportunity pass. We shed our clothes and pedal along, tourist trucks in the distance may spot us but I was relying on the weird, hallucinogenic nature of the terrain to diffuse their fears. Bolivians living up on the Altiplano have a reputation for being reserved and shy. I don’t have any photos of the colourful people we met en route, nobody would consent to their photos being taken. I try not to generalise and stereotype people, I’m sure there are plenty of gregarious Bolivians, but after travelling though so many countries it becomes difficult not to, and I reckon Bolivians do the same. I’ve cycled through at least three Bolivian villages, the inhabitants of which probably now believe that the majority of British men have matted facial hair, mayonnaise-stained clothes and own an overwhelmingly aroma of onion and feet. Riding through the Bolivian villages we ran a gauntlet of barking, chasing dogs whilst locals looked on, inanimate, silent and so I figured, complicit in the chase. We sometimes sang “Ghost Town” by The Specials on the way in to these deserted villages, even those locals who own shops or hostels need to supplement their income by working in the fields so it was often impossible to buy basic supplies or find a bed until the evening. Gradually the terrain flattened out, women worked the fields, brightly coloured shawls tight across their back supporting mystery loads. A few returned my waves, but not many. By six pm I had another companion, a dark shadow-cyclist, pushed into the rough to my right by the low sun. At breaks Nick and I shared tales from the road, we sang bad eighties rock ballads and sang badly to better eighties rock ballads, we did impressions of some of the frightfully posh and endearingly naive Gap Year students called Rupert or Tarquin we’ve met along the way. And then we made it to Ururo. As we cycled out of Ururo we hit a sequence of these blockades but brazenly pushed past them, hoping that, as cyclists, we’d be immune to any violent outbursts. The banner clutching crowds had used upturned bicycles, rocks and pieces of wood to close the roads, on some routes they had even drilled up the tarmac and piled up the fractured asphalt and soil to stop traffic. People jeered. I asked a woman what it was all about and she launched into a tirade. I wished the protester “mucho suerte” and continued on. On Highway One, the main artery to La Paz, instead of the usual heavy traffic there was a swarm of jostling pedestrians. Grim, downtrodden faces watched us ride past and the scene made me think of an exodus of refugees departing a war torn city. The burnt metal remains of something scarred the tarmac, maybe a motorbike. Up ahead there was a larger mob and I became nervous, but as we wheeled our bikes through the hoard a ripple of applause built and cheering began, we sheepishly said thank you and smiled our appreciation. A few kilometres later a group of young soldiers, wearing even bleaker expressions than the protesters, stood vigil, rifles in hand. I gave them the same enthusiastic and over the top smile and wave I reserve for all men with guns and kept cycling. We had been warned that Highway One was busy and potentially a bit dangerous for cyclists but with the blockades in place we had the road almost all to ourselves. Finally – La Paz, which can boast perhaps the most dramatic entrance to any city in the world. As we cycled through the slum district of El Alto, suddenly to our right, La Paz jumped out of the trees. Loose folds of city were awkwardly sprawled over the sides of several mountains. The shiny tin roofs of the houses glinted in the midday sun and we freewheeled into the mayhem of another enticing and animated South American city. After a 17 day ride with only one day off, La Paz was a welcome break, and because one day it would be nice to father children, I decided to take a whole week off Bolivia’s bumpy roads. Next I ride past Lake Titicaca and to Cusco in Peru to catch up with Tom, an old friend from my time in Liverpool, before visiting the famous Inca ruins at Machu Picchu and then rattling through the rest of Peru. Finally here’s a couple of links… an article I wrote about a border crossing from Argentina to Chile in an online magazine called Sidetracked and an interview with a US based magazine called Sierra. Steve, it's always a pleasure to read your blog. Suerte! I'm really enjoying your journey. You quote H S and Kerouac in the space of a few paragraphs… Marry me! Out of fear & love I never cycled Bolivia… Great story and great adventure! Hey doc, don't know if you remember that Daily Voice journalist in Cape Town who interviewed you, but if you do, as promised I'm following your blog and what a way with words you have. it's really fantastic, and i have a sudden yearning to visit bolivia. enjoy the rest of your fabulous journey. I began to read from the start of your journey a few days ago, and have read it all since. What an epic adventure, I really wish you luck and I'm not sure if you heading to Alaska will have you passing through Dallas, Texas, but if so, you have a nice sofa to sleep on here, and it'd be my pleasure to buy you a steak and some beer. I've only been cycling for about a month now, but it's something I wish I had discovered sooner. I'll be watching and reading, stay safe and keep up the excellent writing and cycling! When did you cycle the salar (hard to say if the blog date is correct)? During the wet or dry season? I am thinking about cycling the Salar in November. Any idea if it is possible?